It's really hard to remove glitter manis, like the one I did last week with Rainbow Honey polishes. That mani had three layers of glitter polish! 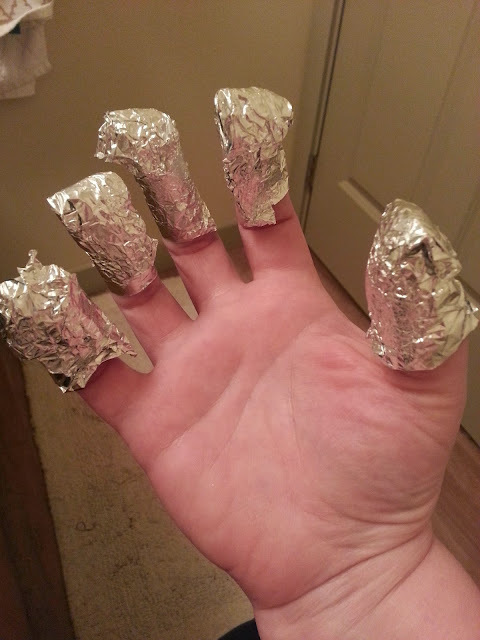 If you try to just swipe it off with remover and a cotton ball, the cotton just gets stuck in the glitter, and if you scrub hard you can do real damage to your nails. This isn't a new technique that I made up or anything, but I thought I would share it in case my readers didn't know about it! Here's a video from my fave YouTube beauty guru, Julia Graf, that shows the method in detail. She uses cotton rounds, but you can use cotton balls in a pinch.